working in this field for over 30 years. 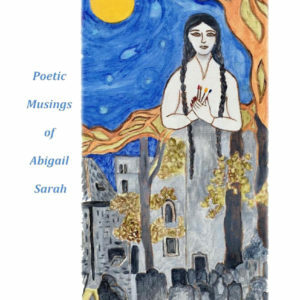 This website is the showcase for the spiritual and Kabbalistic works of the mystical artist and poet Abigail Sarah Bagraim. 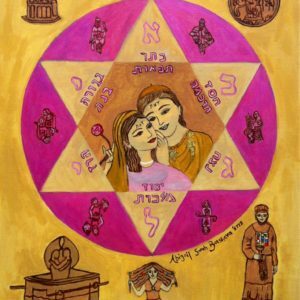 Abigail is a Jewish mystical painter whose paintings are informed by the two parallel paths that she has followed in her academic studies, namely Fine Art on the one hand, and Jewish and Comparative Religious Studies on the other. 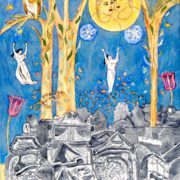 Her art works are a merger of these twin disciplines: her mystical, religious musings provide inspiration and content for her paintings; while the artistic process of creating visual images affords her the opportunity to contemplate and meditate deeply on their metaphysical subject matter. 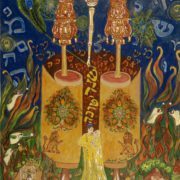 Her resulting art functions at two levels: firstly, as visual images to be considered in their own right; and secondly, as mystical visions that can be explored to discern deeper underlying Kabbalistic meaning and symbolism. 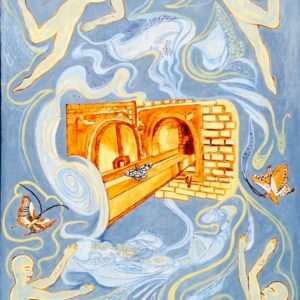 Abigail’s art works can be viewed in the galleries of her works on the page of this website titled “ABIGAIL’S ART”, where her works are divided into various categories and brief explanatory comments have been provided for some, but not all, of the works. 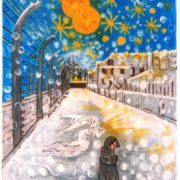 Prints of these works can be ordered online, as can some original works that are still available for sale. Commissions can also be discussed. 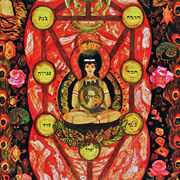 For those who wish to engage at a deeper level with the symbolism and underlying meanings of Abigail’s works, the “JEWISH SPIRITUAL ART” page introduces the viewer to the subject of Jewish spiritual art; and the “KABBALAH ART” page provides a more specific and detailed explanation of the highly esoteric mystical concept of Kabbalah that is the focus of much of Abigail’s art. 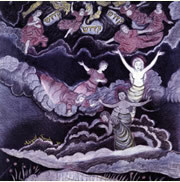 The “POETRY FOR THE NESHAMA” page contains some of Abigail’s recent illustrated poetry. If you would like to contact Abigail please click here. 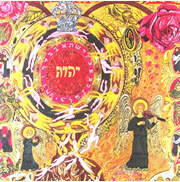 Abigail’s paintings represent the Jewish Mystical Tradition and deal with subjects such as the omnipresence of G-d; the battle between good and evil; the divine mystery of our universe; the shining seraphim flying between heaven and earth; the union of soul and world; and the unification between the masculine element of the divine and the Shekhinah. 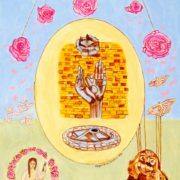 The paintings provide the viewer with a visual understanding of these fascinating philosophies and concepts, and a glimpse into the invisible realms of the spiritual universe. 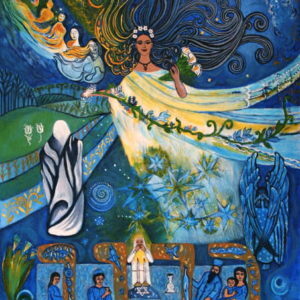 Many of these ancient spiritual precepts and archetypal sources resonate at various levels with those of other religions, and Abigail believes that by drawing upon these commonalities it is possible to illustrate the basic oneness in the universe and the unity in all things. 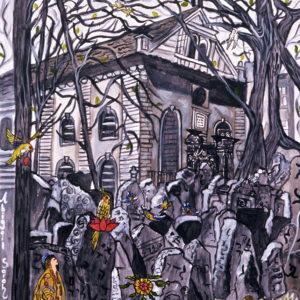 An article on Abigail’s series of Holocaust paintings appears in the Pesach 2015 edition of the “Jewish Affairs” magazine. 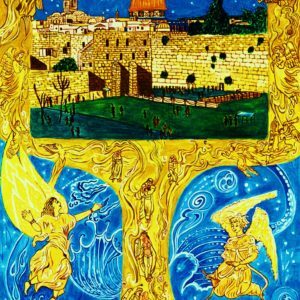 It was written by the art historian Uta Ben Yosef and is titled “Revealing Invisible Realms of the Spiritual Universe: The Art of Abigail Sarah Bagraim”. 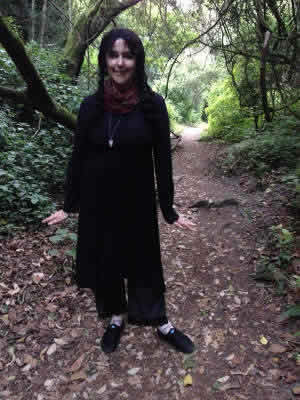 To read the article click on this link and you will be taken to the magazine, where the article can be found at numbered page 29 of the 68 page electronic link (which is printed page 27 of the magazine).